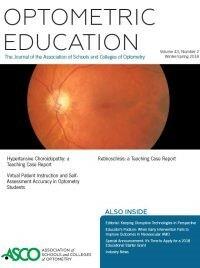 The Association of Schools and Colleges of Optometry invites applications for the position of Associate Editor of its peer-reviewed journal, Optometric Education. The Associate Editor is responsible for collaborating with the Editor on the editorial content of ASCO’s journal, including sharing the writing of three editorials per year. The Associate Editor consults with the Editor on appointments to the journal review board and works with the Editor and Managing Editor in facilitating a smooth peer review process. He/she also assists with the development of issue features and solicits manuscript contributions to the journal. Strong writing and editing skills, educational publication experience and a demonstrated interest and involvement in optometric educational issues, are required. The successful candidate will possess the Doctor of Optometry degree and have a minimum of 3 years experience in optometric education. The associate editor position is a volunteer role.